Oval diamonds have recently had a surge in popularity and we’ve definitely seen an increase in oval diamond sales. 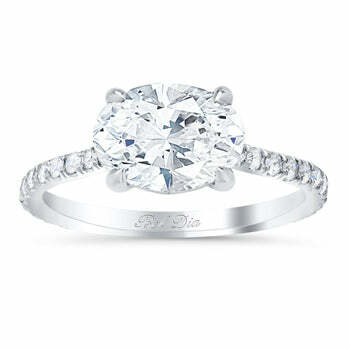 Oval diamonds are incredibly flattering for the wearer’s finger due to their elongated shape. They come in varying ratios, which you may learn more about on our diamond education page. 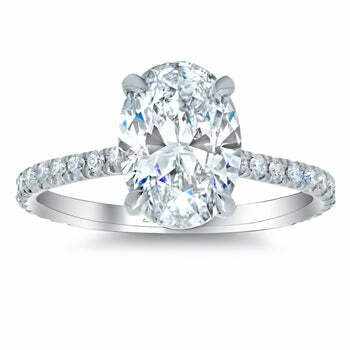 Below are our currently available diamond accented engagement rings that are shown with an oval-shaped center stone. An oval diamond engagement ring with three rows of pave diamonds on the band enhances the sparkle and beauty of the center stone. This ring features G color VS clarity diamonds and the setting can be manufactured for an array of diamond shapes and carat weights. The ring’s band has a width of approximately 3mm. This engagement ring is one of our most popular designs and it’s easy to see why. The u pave set diamonds on the band add ample sparkle to the ring while not taking away the spotlight from the center diamond. The ring can be made for any shape diamond and features approximately 0.40 cttw of G color VS clarity diamonds. This engagement ring is similar to the last one featured, but it has a modern twist. 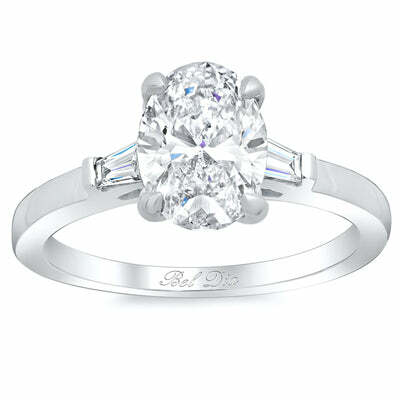 The center diamond is set east-west (horizontally) in order to give the ring a more updated look and feel. An east-west set oval diamond will give the wearer more finger coverage. The ring is set with 0.45 cttw G color VS clarity diamonds. Finally, a three stone oval engagement ring completes our featured rings today. 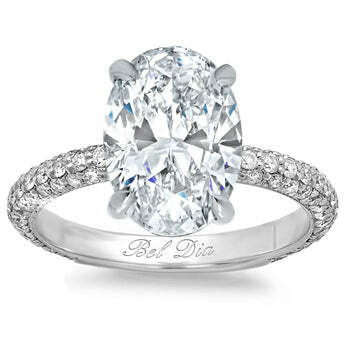 An oval diamond is set between a baguette diamond on either side creating a timeless and iconic piece of jewelry. The baguette diamonds have a total carat weight of 0.26 cttw and they will have G color VS clarity.